Grind 1 cup raw oats into a flour. Mix with 1/2 cup plain Greek yogurt, 2 tbsp water, 1/2 tsp cinnamon, 1/2 tsp baking powder, and 2 stevia packets. You should have a nice, thick dough. Split into 3 portions. Roll each portion on a flat surface to make long pieces. 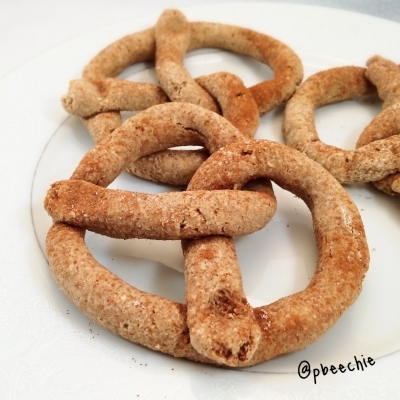 Form each into a pretzel shape. Place on a baking sheet sprayed with nonstick spray. Top with more cinnamon and stevia.